Do Your Belts Hang Low? Do your belts hang low? Do they wobble to and fro? If they do, then you need to take care of it, but if you are not sure, then we need to talk. The belts to which we refer are the accessory drive belts on your engine. There are two types of accessory belts, V-type and serpentine. Which one you have depends on your specific vehicle. Since the mid-1990s, most cars and trucks use serpentine belts, though you may find a few stragglers into the early 2000s. The accessory belt(s) are what connect the accessories to the crankshaft. The accessories include the water pump, alternator, AC compressor, power steering pump, and air pump or vacuum pump. When the belt(s) lose their tension, all sorts of bad things start happening, and if left unchecked, eventually the belts break and you end up stuck on the side of the road. All of this can be prevented with just a little routine maintenance. Older vehicles use V-belts to drive the accessories. These belts are typically divided among the accessories in groups. 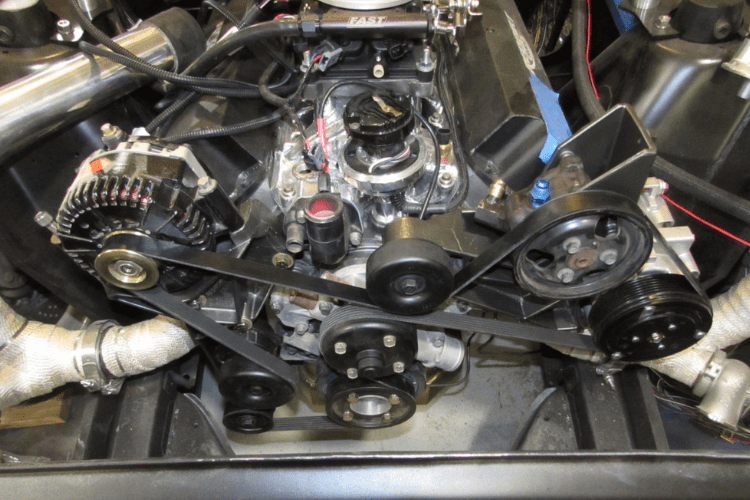 This is because V-belts can’t cover all the accessories with one belt, so you may have only one belt (alternator, water pump, and crank) or three or four belts, all running different accessories. There are special concerns when it comes to V-belts, because they come in a couple of different widths. Use the wrong width, and your belt may sit too deep or too far out of the pulley groove, which leads to throwing the belts off. 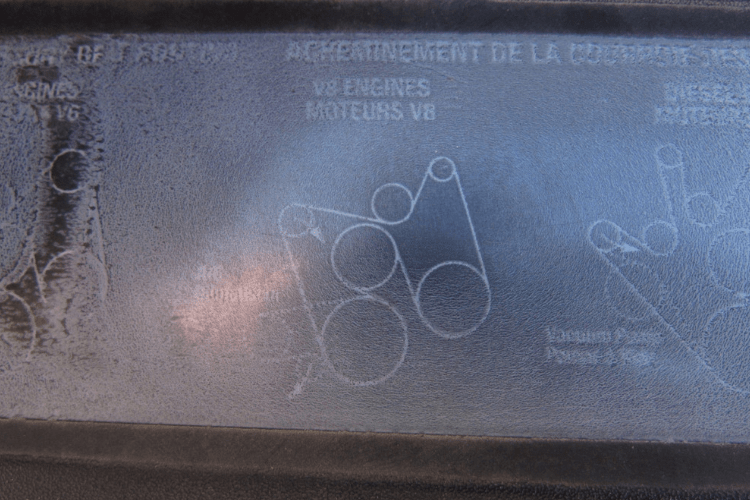 V-belts have a tendency to squeal more than serpentine belts. As the belts age, they lose their tension, so they have to be checked and re-tightened. A good rule of thumb is to check the belt tension with every oil change. A properly tensioned V-belt should have ½” of play when pushed with your thumb. Any more is too loose and the belt will squeal and possibly come off. If it is too tight, then the belt will wear prematurely and will damage the bearings on the accessories themselves. There is certain amount of fraying that is natural, even with a brand-new belt. This is part of the manufacturing process, but when the frays stop looking like fuzz and are noticeable, then your belt needs to be replaced. If any part of your V-belt has chunks missing, it is severely worn and needs immediate replacement. The sides of the V-belt that run against the pulley should be dull rubber. If they are shiny or glossy, that means the belt is slipping and it either needs to be tightened or replaced. A cracked belt is a belt that will leave you stranded, replace it. V-belts should be sharp at the edges, clean and crisp. Over time, the inner edges of the V wear away, leaving a U-shaped belt instead. You can buy wear gauges, but if the belt has lost its V, it needs to be replaced. 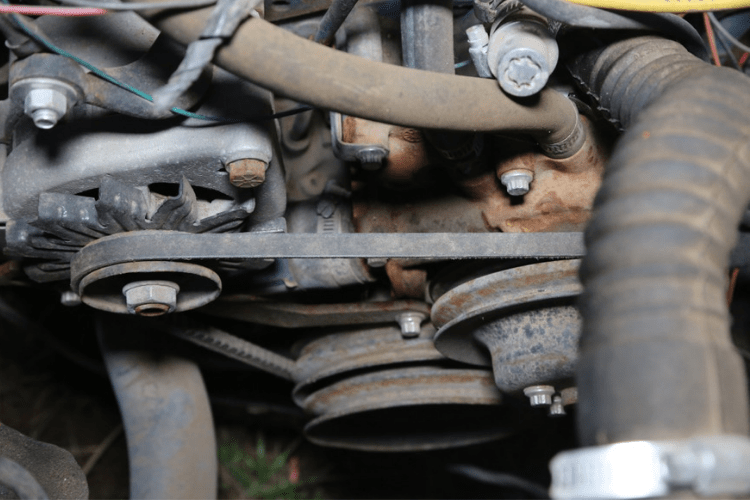 Nearly every modern vehicle uses a single serpentine belt, though there are a few vehicles that run a secondary serpentine belt for small accessories. 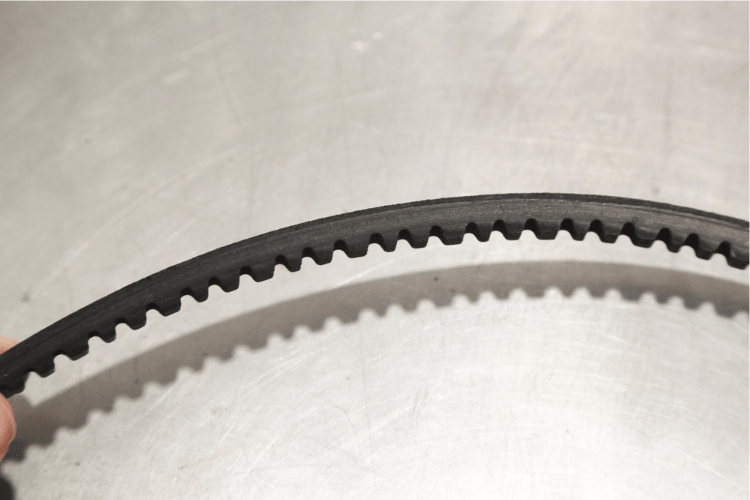 Serpentine belts are wider than v-belts and are flat, so they can wrap around each pulley and are capable of supporting either side of the belt. One side of the belt is ribbed, one is typically flat. Some newer belts have ribs on both sides. The ribs must match the pulley, so a smooth pulley takes the smooth side, and the ribbed side rides on the ribbed pulley. Serpentine systems use tensioner and idler pulleys to facilitate wrapping around the pulleys. In addition to the belt itself, the tensioner and idler pulleys wear out as well. It is a good idea to replace the belt and tensioners at the same time. It is normal for ribs on the belt to crack, but this is also an indicator of wear and heat exposure for the belt. Once the cracks occur between 1 and 2 cm apart from each other, then the belt has reached the end of its useful life and should be replaced. If there are more than 4 cracks in a given 1-inch window, the belt is too far damaged as well. When cracks are left unchecked, the eventual result is chunking, where the cracked area begins to split away. This is a sign of imminent failure. As the belt wears, tiny pieces of rubber can gather in the grooves of the ribs. As this builds up, it is called piling. This is caused by misalignment, worn pulleys, too light tension, or a combination of the preceding factors. Replace the belt along with the tensioner and idler pulleys. When the belt is making contact with another component, it can become shiny, glazed, or visibly worn. If the belt has cuts or exposed belting, it must be replaced immediately and the cause located and fixed. If the pulleys are not aligned, the ribs can be sheared off or pulled away. The belt will not have a regular lifespan and must be replaced and the pulleys checked for alignment. When a foreign object, such as a pebble or other debris is caught on the pulley ribs, it leads to uneven rib wear. Locate the object and remove it. It is a good idea to replace the belt at this time as well. Misaligned pulleys and worn bearings often lead to frayed edges on the belt. 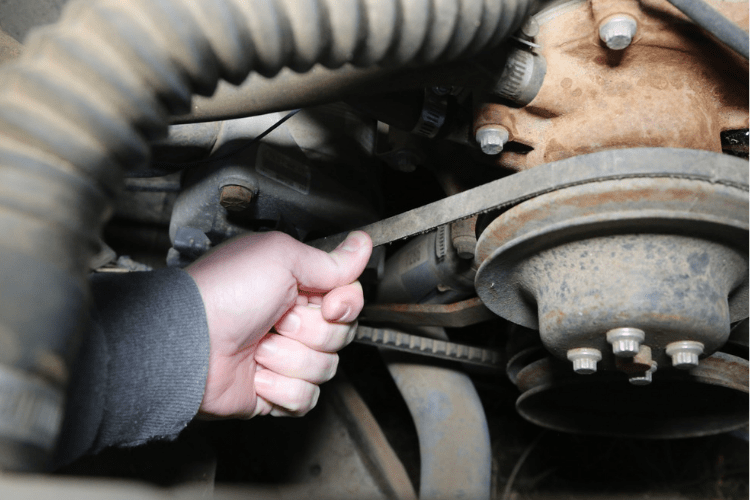 If left unchecked, the belt will break or be thrown off, and engine damage can occur. Replace the belt and check the alignment of the pulleys. Most belts are resistant to automotive fluids, however time and heat can cause leaks to damage the belt. Oil, fuel, power steering fluid, and other chemicals can cause the belt to become flaky, sticky, or swollen. If the belt is dried out, gummy, or spongy, it needs to be replace immediately and the leak found. Checking your belts is a necessary yet often overlooked task. Do not let yourself become stranded on the side of the road because you didn’t check your belts. As a side note, belt dressings are ONLY for V-belts made from neoprene. And while they will quiet a squeaky belt for a short time, the problem will come back. 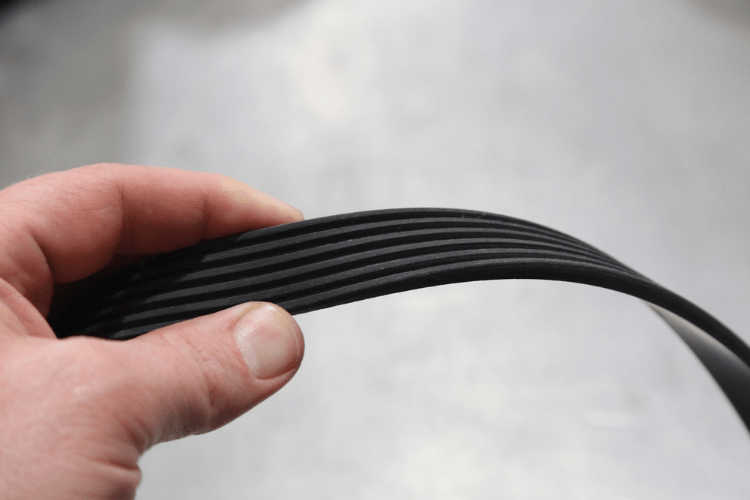 Belt dressing should NEVER be used on EPDM belts and never on any serpentine belt.